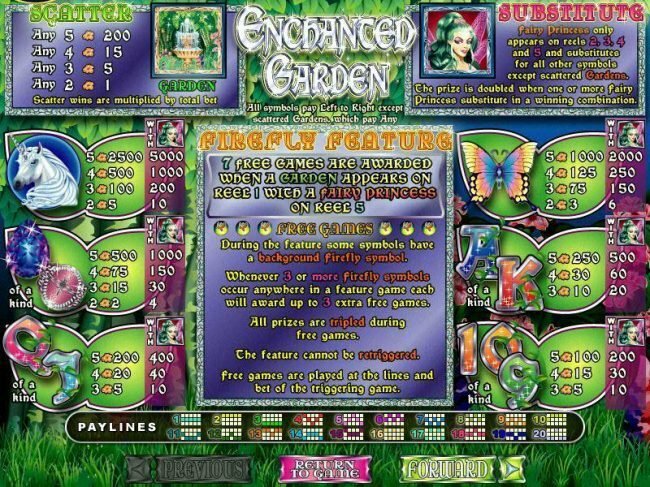 Slot review the free play Enchanted Garden online slot machine produced by RTG software with 20 lines and 5 game reels. 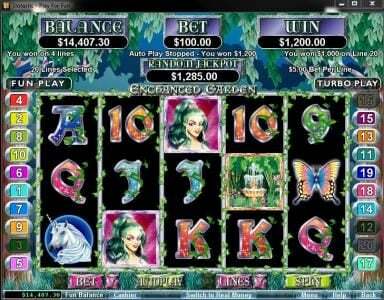 Enchanted Garden Slots 5 out of 5 based on 6 ratings. 6 user reviews. 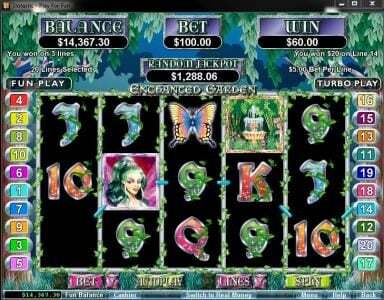 Enchanted Garden is a 20 Payline, 5 Reel Real Time Gaming Progressive Jackpot Online Casino Game. The game will come with the in game features of scatter symbols, free spins, wild symbols and multipliers. The game has a beautiful theme to it and because of it you are never bored with the game. You are charmed by the charming enchanted characters they show on the symbols. This game offers beautiful visuals that cannot be beaten by another slot game, sound performance that never falters and a speed performance that shows no lag ever. It would be absolutely amazing to play a slot game in this completely new enchanted world and then be rewards with the ultimate progressive jackpot prize. Everyone will get an equal chance to win the progressive jackpot because the progressive jackpot is hit on random. This means every time you land on a winning combination it could be the progressive jackpot. You can fall in love with a game that has a beautiful theme like this. High rollers will lose the grasp of time with this game and will wager a lot of money in on night. You can wager anywhere around $0.01 to $5 on every single payline. This means that you could have the potential to wager $100 per spin. Who doesn't love a fairy? If you weren't a big fan of them before you will be soon because a fairy in the Enchanted Garden slot game will be very beneficial to you. They will substitute all the other symbols and can only be found on the fifth, fourth, third or second payline. The only symbol that won’t be removed from the game is the scatter symbol. When you land on a winning combination you're prize money will instantly be doubled. The main symbol within this game is the scatter symbol. This symbol will allow for you to receive Free Spins and triple you're winnings as well. You must pray for one of these symbols because if you do and you land on the progressive jackpot you will win a huge amount of money. Overall this game is one of the very best slot games any players will ever play for the rest of their lives. It offers such a high degree of gaming quality that has never been seen before. You can win such a large amount of money when you're playing with one of these games. 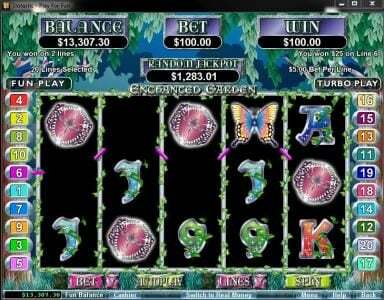 It is the reason why so any players have begun to play at the Enchanted Garden Slot Game and you should to. This RTG casino All Star Slots delivers exciting games and slots served with a great 100% bonus all the way up to $787. This RTG casino Casino Extreme offers lots of fun games along with a $30 no deposit casino bonus and a large 100% bonus all the way up to $500. Be sure you do not use multiple free Casino Bonuses at Sloto Cash as they may not pay you for not following terms. Be sure when you use a no deposit bonus code from Slotastic as with most run casinos, you must make a deposit if your last casino bonus was also a no deposit one. Slotland requires that you have to make a deposit between multiple Free Casino Bonuses to be allowed to make a withdraw. China, Czech Republic, France, India, Indonesia, Latvia, Lithuania, Malaysia, Ukraine and Vietnam locations are restricted at Slotland casino. Slotastic requires that you have to make a deposit between Free Casino Bonuses to be qualified to make a cash out. Do not use multiple free promotions back to back as your winnings could be voided without making a deposit. Uptown Aces terms state that you have to make a deposit between multiple no deposit bonuses to be able to make a withdraw. Uptown Aces requires that you must make a qualifying deposit between multiple no deposit bonuses to be able to process a cash out. Slotastic terms state that you must make a qualifying deposit between multiple free Bonuses to be qualified to process a withdraw. Take care you do not use more than one no deposit Casino promotion as they may not pay you for violating terms. American Samoa, Andorra, Anguilla, Aruba, Barbados, Belgium, British Virgin Islands, Cayman Islands, Chile, Cook Islands, Guam, Iceland, Luxembourg, Marshall Islands, Martinique, Mayotte, Mexico, Monaco, Montserrat, New Caledonia, Niue, Norfolk Island, Northern Mariana Islands, Portugal, Puerto Rico, San Marino, South Africa, Spain, Tokelau, Uruguay and Venezuela locations are forbidden at Ruby Slots. Diamond reels terms state that you have to make a deposit between Free Casino Bonuses to be able to process a withdraw. Note that Chile, Denmark, Finland, Japan, Philippines, Poland, South Africa and Turkey players are restricted at Diamond reels casino. Be sure when you use a free Casino Bonus code from Diamond reels Casino as you know with RTG run Online Casinos, you have to make a deposit between No Deposit Casino Bonuses. Note that Chile, Denmark, Finland, Japan, Philippines, Poland, South Africa and Turkey players are forbidden at Diamond reels. Diamond reels requires that you must make a deposit between multiple free Bonuses to be qualified to process a cash out. Note that Chile, Denmark, Finland, Japan, Philippines, Poland, South Africa and Turkey players are restricted at Diamond reels. Uptown Aces requires that you have to make a qualifying deposit between multiple free Bonuses to be qualified to make a cash out. Be sure when you use a No Deposit Casino bonus code from Sloto Cash as you know with RTG run casinos, you have to make a deposit if the last bonus was a no deposit one. Free Spin terms state that you must make a deposit between no deposit bonuses to be able to process a withdraw. Diamond reels terms state that you have to make a qualifying deposit between multiple free Bonuses to be able to process a withdraw. Take care you do not use multiple no deposit bonuses back to back at Diamond reels as they may not pay you for not following terms. Diamond reels casino is prohibited in Chile, Denmark, Finland, Japan, Philippines, Poland, South Africa and Turkey locations. Uptown Aces terms state that you must make a deposit between Free Casino Bonuses to be allowed to process a cash out. Take care you do not use multiple no deposit bonuses at iNET Bet as your balance may be voided without a deposit. iNET Bet is restricted in Afghanistan, Albania, Armenia, Azerbaijan, Belarus, Bosnia and Herzegovina, Bulgaria, Costa Rica, Croatia, Czech Republic, Denmark, Estonia, France, Hungary, Indonesia, Iran, Iraq, Latvia, Lithuania, Malaysia, Moldova, Montenegro, Pakistan, Romania, Serbia, Slovenia, Turkey, Ukraine and Zimbabwe locations. Do not use more than one no deposit bonus as they may not pay you for violating the rules. Do not use multiple Free Casino Bonuses at Casino Brango as your balance could be voided without a deposit. Be sure you do not use more than one no deposit bonus back to back as they may not pay you for violating terms. Do not use more than one free Casino Bonus as your balance may be voided without a deposit. Do not use multiple free Bonuses as your winnings could be voided without a deposit. Fair Go terms state that you have to make a deposit between multiple Free Casino Bonuses to be allowed to process a cash out. Note that Bulgaria, Costa Rica, Denmark, Israel, Oman, Poland and Ukraine players are restricted at Fair Go. Take care you do not use multiple no deposit promotions as they may not pay you for violating the rules. iNET Bet terms state that you have to make a deposit between Free Casino Bonuses to be able to make a cash out. Afghanistan, Albania, Armenia, Azerbaijan, Belarus, Bosnia and Herzegovina, Bulgaria, Costa Rica, Croatia, Czech Republic, Denmark, Estonia, France, Hungary, Indonesia, Iran, Iraq, Latvia, Lithuania, Malaysia, Moldova, Montenegro, Pakistan, Romania, Serbia, Slovenia, Turkey, Ukraine and Zimbabwe locations are forbidden at iNET Bet. La Riviera requires that you have to make a deposit between multiple free Bonuses to be able to process a withdraw. Be sure when you use a No Deposit Casino bonus code from Grande Vegas Casino as you know with RTG powered Online Casinos, you are required to post a qualifying deposit if the last bonus was a no deposit one. Take care you do not use multiple no deposit casino bonuses at iNET Bet as your winnings may be voided without a deposit. Afghanistan, Albania, Armenia, Azerbaijan, Belarus, Bosnia and Herzegovina, Bulgaria, Costa Rica, Croatia, Czech Republic, Denmark, Estonia, France, Hungary, Indonesia, Iran, Iraq, Latvia, Lithuania, Malaysia, Moldova, Montenegro, Pakistan, Romania, Serbia, Slovenia, Turkey, Ukraine and Zimbabwe countries are restricted at iNET Bet Casino. Do not use more than one free Casino Bonus back to back as they may not pay you for not following terms and conditions. Slotastic requires that you must make a deposit between multiple Free Casino Bonuses to be able to make a withdraw. Do not use multiple no deposit bonuses at Intertops as they may not pay you for not following the rules. Be sure when you use a free bonus code from Intertops as you know with Proprietary run casinos, you are required to post a deposit if your last Bonus was a no deposit one. Intertops requires that you must make a deposit between Free Casino Bonuses to be allowed to process a cash out. Be sure you do not use more than one free promotion back to back at Sloto Cash as your winnings could be voided without a deposit. Australia, Israel and United Kingdom countries are not able to play at Sloto Cash casino. Fair Go requires that you must make a qualifying deposit between multiple Free Casino Bonuses to be able to make a cash out. Note that Bulgaria, Costa Rica, Denmark, Israel, Oman, Poland and Ukraine players are forbidden at Fair Go. Bonus is great on this game. 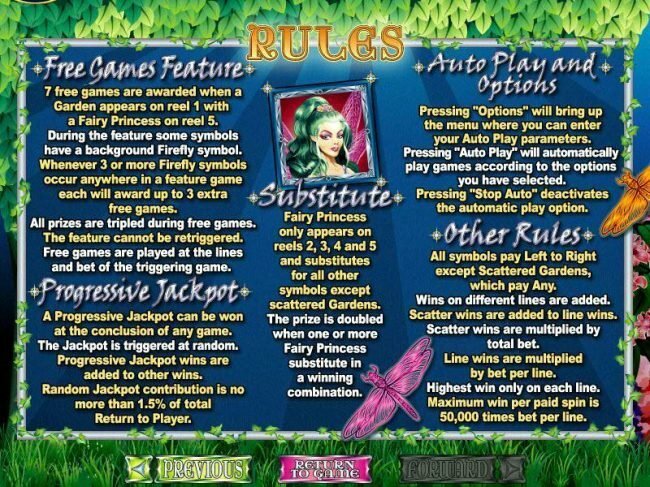 If you get the FAiry on the first reel and the fountain on the last reel you get 7 free spins. These can turn into so much more. Every time you get three of the special different symbols, you get extra free spins. One time I had over 70 spins! Enchanted Garden is a fun game to play. The fairy will double your wins. The gardens are scatter pay. In the free spins round you have a chance of adding more free spins for your play. This slot game is a favorite used for tournaments a lot of the RTG tournaments. I enjoy playing this one in the tournaments. A player lands a feature when the fountain symbol lands on the 1st reel and the pink fairy lands on the last reel. The nice thing about the free spin feature is that it awards more free spins when 3 or more fairy, fountain or unicorn symbols appear anywhere during the feature playing. It also awards a very nice multiplier this ia a definite one to have a spin when playing RTG platforms. 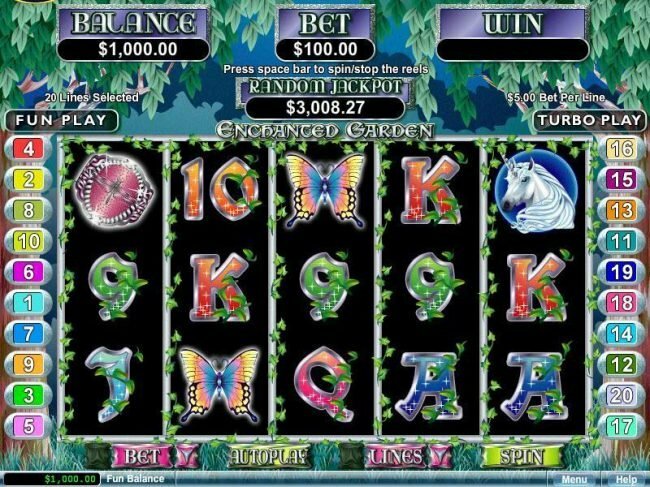 Enchanted Garden video Slot is fun and enjoy playing. The fairy is wild and doubles your win. Seeing a garden on reel 1 and the fairy on reel 5 gives you the free spin round in which you can get 7 spins to start out. Within the Free Spins you can get more Free Spins by getting any combination of Unicorns, fairies, and gardens of 3 or more. Flowers fairies and unicorns if you like these things this is the game for you . Once you get the Free Spins the retrigger quite frequently I like this game . This is a very cute game but i think its more for the ladies..its the fairies and all enchanted things that girls like..but it is a good paying game and boy oh boy the Free Spins can rack up in a bonus rd really fast ! Min bet is 20 cents ..once you hit the bonus round ..the fairies and waterfalls that appear give you more Free Spins ,,some hide 10 ,5,1 free spin .This game is defin. worth the shot!